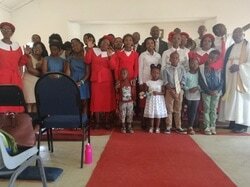 Our Lesotho Churches are in Maseru, Clocolan, Khopane, Luka, Mafika Lisiu, Mpiko and Qopo. 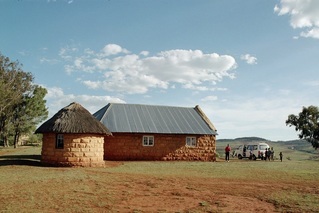 We are currently running a donation campaign for the Lesotho High School. Any donation given to this purpose will be double-matched by our Corporation until our goal of $350,000 is reached. Your donation of $10 will really be a donation of $30! To build an attractive High School that will be distinct from other schools in the country. Our school will prepare boys and girls for spiritual affection; it will teach them not only to learn religion but also to live it. We will teach students practical subjects, such as agriculture, home economics, carpentry and leather work. It will be a boarding school to accommodate students who come to the school from a distance. To enable all students to attend a school that is affordable. We have a well-situated site on 13 acres. On the eastern side there is a creek that will aid in teaching the students about farming. The production of food will feed the students, which in turn will contribute greatly to lowering the fees. We will plant vegetables, fruits, grains, and raise chicken for eggs and broilers, as well as dairy cows. We will feed the students and sell surplus to community and use the proceeds to operate the school. All students will be taught: Religion, English, Science, Sesotho (mother tongue), Business Studies, Mathematics and Agriculture. All students will be required to take religion classes so that they are being prepared for the life of being useful. from Australia were sent to Lesotho to obtain Basuto ponies for use in the Italian campaign in the mountains of Northern Italy. The small Basuto ponies were sure-footed and acclimated to high rugged mountains. One of those soldiers was a New Churchman and left a copy of the Third Testament in what was then called Basutoland. It is from this book that the New Church began in Lesotho. Rev. Theodore Pitcairn was surprised to find a group studying under Rev. Samuel Mofokeng when he traveled to Lesotho in the early 1900s.